Events have always been about creating experiences. That, and ensuring attendees walk away with the brand messages and key takeaways intended by the event’s planners and stakeholders. This is a worthy goal on paper, but how does one do that effectively, and how can technology help create that lasting impression? Here to discuss the role technology plays in helping event professionals design better experiences is FMAV’s Anthony Vade. How can technological solutions be used to create event connections? Anthony Vade: In my role developing technology design and engagement strategies at FMAV, I am responsible for understanding the industry and predicting the solutions we will need in the future. To do this, my team at FMAV DesignHub has segmented our solutions and services into three impactful pillars. The first is environmental. That is, how do we make attendees feel emotionally through the aesthetics of the event using audio, visual, and lighting? Then, how do we integrate and enhance décor and scenic elements? The next is immersion. Immersive solutions create unique experiences that aren’t typically seen at live events, such as virtual reality, augmented reality, mixed reality, holographic technology, projection mapping, webcasting, and immersion rooms. The third pillar is engagement. The most successful events are the ones that turn event attendees into event participants. That’s because attendees want more personalized experiences. They want two-way conversations and to contribute to the discussions. Engagement technology tools are designed to be the conduit through which these connections can be made. How can positive emotions be encouraged through event engagement? AV: For one, we have been creating technologies that encourage participants to play a game that plants a subconscious message in their minds or extracts an emotional response from them. These responses can help us gauge their feelings around a topic or event experience. For example, let’s say a large beverage company has many different brands and flavours ready to sample. When the attendee walks up to the game they will inherently pick the brand or flavour they like the most. They do this because they subconsciously think it will perform better in the race. That is a very basic example of subconscious surveying. What are some other engagement technologies available today? AV: A good example is Glisser, which is a presentation and audience response software platform that engages attendees through live slide sharing, digital Q&A and polling, while also providing digital note taking and allowing for real-time content feedback. After an event, it enables planners and presenters to export all the data for analysis to help them make better decisions in the future. If you are basing all of your planning on your post-event survey, you are probably working with some flawed data. After all, anytime someone experiences any emotion outside of the “planned” emotion, I want to know about it in real time – not days or weeks later when they have mellowed. Glisser does this. How else does engagement technology benefit event stakeholders? AV: For Virtual Events, you need to know if your remote audience is watching, logging in or walking away. You also need to determine if they are they getting distracted by emails and not paying attention. By putting engagement technology side-by-side with your webcast, for example, you can measure the attention of your audience. You can keep their interest and make them feel like they are contributing to the live event. Anthony Vade is an account manager with FMAV, a leading audiovisual and event technology company. He can be reached via email at [email protected], on Twitter (@avconnecting) or LinkedIn. 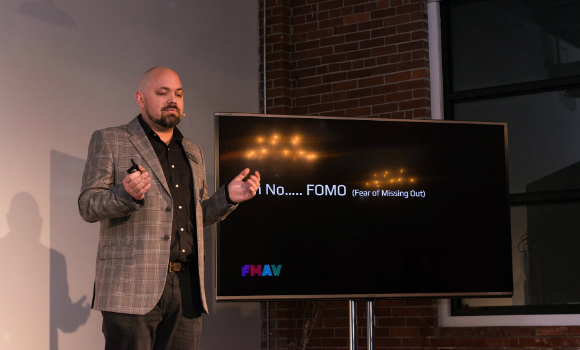 This entry was posted in Industry Insights and tagged Anthony Vade, attendees, connections, emotions, engagement, environmental, event, experiences, fear of missing out, FMAV, FOMO, immersion, planners, stakeholders, technological solutions, technology.